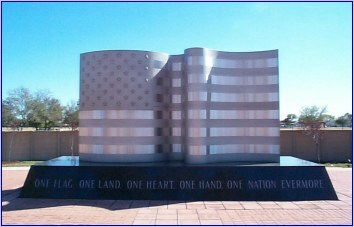 The Veterans Monument at the historical site of the former Kelly AFB, now KellyUSA,was dedicated in May of 1992. The original intent was to honor service members who took part in Operations Desert Shield and Desert Storm; but, later, base officials decided that it should be dedicated to both civilian and military personnel who had served their Kelly Air Force Base and our proud Country. The metal monument is designed in the shape of the U.S. flag and rests on a black marble base on which are described the words of Oliver Wendell Holmes: "One flag, one land, one heart, one hand, one nation evermore." The floor of the plaza where the monument sits is covered with bricks. Construction of the monument was funded by the sale of these bricks, which were then engraved with the name/names of the honoree. There are two styles of bricks …the individual size which has room for the honoree's name, branch of service, rank, and dates of service; and the larger bricks which represent families or organizations. As World War I raged in Europe, the United States began to expand and build up its military aviation forces. In his search for a new Army aviation training site, Maj. Benjamin Foulois found 700 acres of flat farmland with a water supply line near the Missouri-Pacific rail line, then seven miles south of San Antonio. With the help of U.S. Senator Morris Sheppard of Texas, the site was acquired and cleared. Aviation operations began here on April 5, 1917, the day before the United States declared war on Germany. 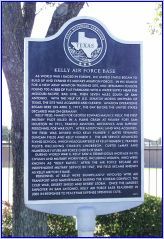 Kelly Field, named for George Edward Maurice Kelly, the first military pilot killed in a plane crash at nearby Fort Sam Houston in 1911, trained aviators, mechanics, and support personnel for war duty. After additional land was acquired, the field was divided into Kelly Number 1 (later renamed Duncan Field) and Kelly Number 2. The Air Service advanced flying school, headquartered at Kelly Number 2, trained pilots including Charles Lindbergh, Curtis LeMay and numerous Air Force chiefs of staff. During World War II, Kelly saw a tremendous increase in its civilian and military workforce, including women, known as “Kelly Katies.” After the Air Force became an independent military service in 1947, the field became known as Kelly Air Force Base. Personnel at Kelly were significantly involved with with air transport and maintenance during the Korean conflict, the Cold War, Desert Shield, and Desert Storm. Once the largest employer in San Antonio, Kelly Air Force Base realigned in 2001 in response to peacetime defense spending cuts.